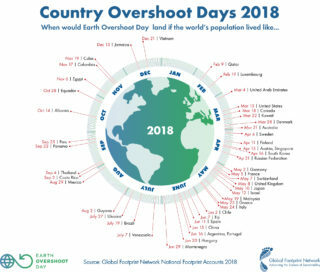 Earth overshoot day 2018- A new (sad) record! It’s holiday season, so maybe you have a minute to think about the Earth overshoot day! Each day at 14h00 we have used up the resources available for the whole day ! Each week on Thursday morning around 3h15AM we are done for the week ! for this decade we have already used up all the resources since 2016 ! So it’s time to join us in our effort to create positive impacts and start inverting this tendency and let’s regenerate our world with our positive actions! STOP waiting for somebody else to solve this problem. We are all part of the change we want to see for our future.